Ecuador’s plan of Government is called “a whole life,” because it wants to be attentive to the human being from the moment they are conceived to the moment of their passing, he continued. Being attentive means caring, motivating, and expressing gratitude. Caring and encouraging are part of the first phase of life. To look after the child during its first thousand days of life is called “a mission of tenderness”. Children are encouraged to study, to play, to be happy, to love science and to delve into technology. It is important to study but also to create. Further, elders should live in a society that is grateful for everything they have done, so that those final years are truly their best years. 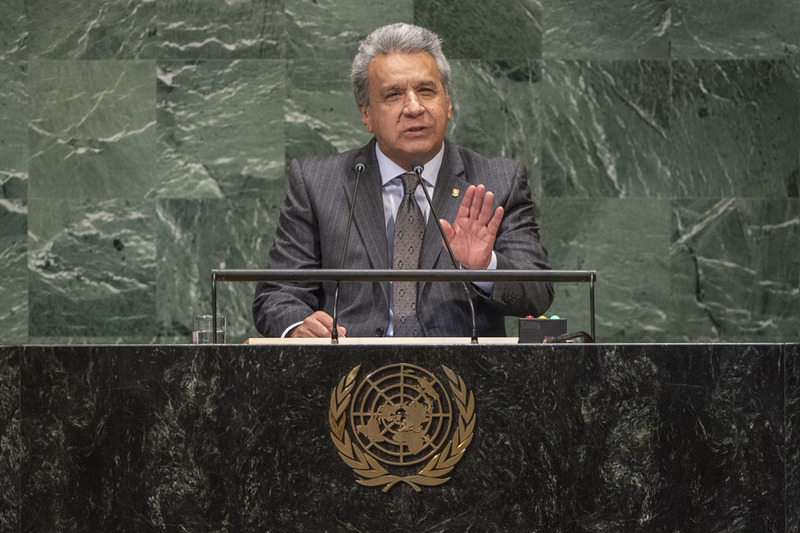 Ecuador’s “whole-life” programme also means all people need to be happy, he pointed out. He noted that, in the great country of the United States, the second line of the Declaration of Independence states “[W]e hold these truths to be self-evident: that all men are created equal; that they are endowed by their Creator with certain unalienable rights; that among these are life, liberty, and the pursuit of happiness.” That Declaration inspired the Constitution of that great country. For this, he said, he did not understand how countries such as the United States could blockade an almost defenceless nation such as Cuba and prevent others from having their right to freedom and the pursuit of happiness.